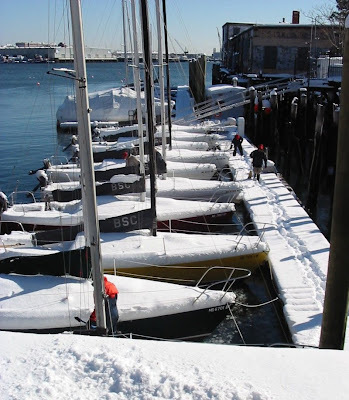 Snow-covered J-24's docked at Boston Sailing Center, Lewis Wharf, Boston, MA, February, 2003. The old wharf building is still standing in this photo, upper right. Now the area is just bare pilings. This post doesn't have anything to do with woodworking, it's about one of my other hobbies, sailing. 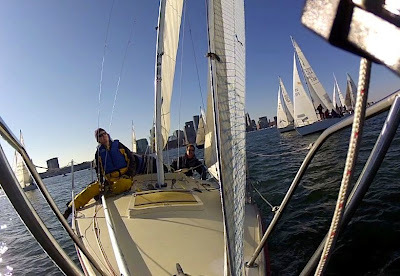 In particular, frostbite sailing/frostbite racing at Boston Sailing Center (see the short video at the bottom of this post). I first heard about BSC in 2000 from a coworker. What a concept! You pay for a membership, cost depending on what size boat you want to use. Then call them up and reserve a boat when you want to go out. It's a fraction of the cost of ownership for a boat, dockage, winter storage, hauling in and out, and maintenance. Most of the boats are 20-30 years old and show some less-than-gentle use, but they're all seaworthy. There was the minor detail that I didn't know anything about sailing, but they also offer lessons. I took my first class that Fall, where I learned just enough to take a daysailer out and back without getting myself killed. As the season came to a close, I heard about Frostbite Racing. Join a crew or sign up as a floater! That sounded like a good way to get experience with someone who knew what they were doing. I paid for a floater slot, then found out about a crew who had just had an opening come up. Other than a couple years mid-decade where I was spending all my money on a vacation house, I've been sailing with them every winter since. And it was very educational. Mike C. and Jen especially taught me all kinds of stuff (and managed not to get too upset when I did stupid things). I also learned what constitutes the range of "normal" conditions, and when it's worth worrying. Under race conditions, you learn to do things fast. You can't stand there wondering what line someone is yelling to haul on. It gave a huge boost to my confidence taking my family out during the warm weather. We race in Boston Inner Harbor. That's a nice protected area between Logan Airport and the waterfront. The Race Committee (the guys in two small power boats) sets up the course according to the prevailing wind, and 17 J-24's race around it. We usually manage 5 races for a Saturday afternoon. The RC boats keep an eye on things in case anyone goes in the water. Survival time for full immersion is measured in minutes, so a real man-overboard situation is to be avoided. Plenty of people get wet feet during chaotic maneuvers. We're all wearing 20-30 lbs. of boots, fleece, and foul-weather gear along with PFDs. For those who think sailing is sitting around sipping champagne with the Howells, think again. Sail racing is a contact sport. This is a small course, and all 17 boats are trying to round the same marks. It gets crowded real fast, with heated calls for "ROOM!" to clear a mark. Contact is inevitable, resulting in a foul that a boat must clear by doing circles. Occasionally a skipper has to pay for damage, especially when one boat T-bones another. The most dramatic collision I saw was when two boats crossed masts in a stiff breeze and ended up spiraling around each other until one of the masts broke at the spreaders. Always an adventure! The conditions range from light, flukey air to heavy days that Jen calls "survival sailing". The RC will fly flags restricting what sails we can use when the wind is up. They also have to take into account the chop, since waves overwashing the bow can ice up the deck. There's also commercial traffic, primarily oil and LNG tankers in and out of the terminal at the head of the harbor, and the occasional barge. These are large, ponderous ships, with deep draft, limited maneuverability, and enough momentum to require a couple miles to stop. They create dangerous currents along their sides and wakes. So everybody gets out of the way when they come through. The police boats and Coast Guard with machine guns make sure. My favorite days are the jib-and-spinnaker days, where the wind is too heavy for a genoa (a large headsail), but still light enough for a spinnaker. Mike's favorite are the days that are too heavy for a spinnaker. The prettiest days are clear blue sky, but the most awesome experience is racing in a snowstorm. Some days it's really, really cold. This year has been unusually warm, hardly qualifying as frostbiting, although out in the open breeze it's still pretty cold. We haven't had to shovel or chip the boats out to get them rigged the times I've been on the schedule (we have a pool of people who rotate through different dates, since our families want us to spend Saturday at home occasionally). Close-hauled on starboard tack, with Jen sitting on the rail and Jonathan in back on sheets. I'm on the rail next to Jen, and the two Mikes are by Jonathan. All those boats behind us? That's a GOOD thing! Some of the crews are very competitive, some are just out for a fun day on the water. Dave Franzel, who founded BSC back in the 70's, is a world champion. Somehow, no matter how dead the air is, he always seems to be in front. He has a real eye for picking the breeze. That's what 40 years of experience will do for you. Our boat is more laid back. As long as there's no blood and no damage, we're pretty happy no matter what, and we get our share of top finishes. Whatever happens on the boat stays on the boat, and there's always next time. I shot a video of last Saturday's races with a new toy. For Christmas I got myself an HD Hero2 camera. This thing is half the size of a deck of cards and includes a watertight case. It shoots full 1080 HD video, with fixed focus and wide angle. I used the bicycle mount to secure it to the bow rail. Unfortunately, the first race was one of those watching-paint-dry events where the wind had died, and then there were delays for two barges and a tanker. The wind came up nicely for the second race, but by then the camera had been out in the cold for nearly 3 hours. After recording an hour and a half of video and time-lapse, the battery died while rounding the windward mark. So I didn't get to record the best part of the day, but the video's still fun to watch. I posted it in full HD glory, so watch it that way in full screen if you can. Hi,the fun of frostbiting is considerably more than about being agreeable. I generally have a great time when I'm doing something that the majority of whatever remains of the world supposes I shouldn't be doing. What's more winter sailing has its own particular feel—the trees are uncovered, the untamed life is diverse, and there's no activity on the water. It's stark, yet wonderful in its own specific way. Also by one means or another the world surrounds you a bit, making an unique sphere of isolation in the more extensive winter world. Everything—the cold, hard gusts, the chilled spray, the diffused light of a winter-yellow sun—feels unique. Planes are arriving overhead.You're imparting an unique world to individuals who're likewise blissful to be out there.You're racing in a tight armada.What could be superior to that?maybe I'd feel diverse on the off chance that I was frostbiting in Norway.